Posted August 12th at 6:00pm. A whole New Season of Madden Mobile is about to begin! On August 16th you'll login to Madden Mobile to an update that will immediately take you into a whole new experience. 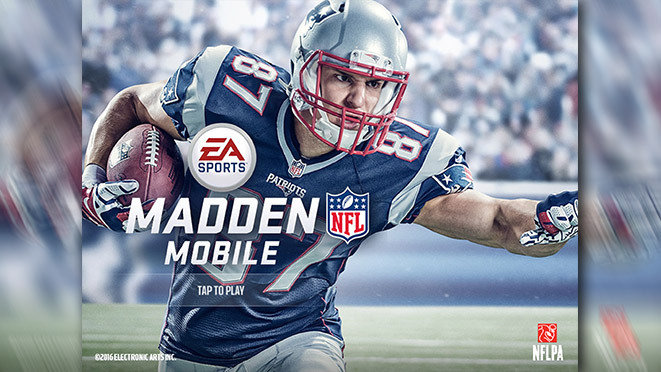 Rob Gronkowski with greet you as the new face of Madden Mobile. Right away you'll be able to jump in and start building your squad from the ground up. New and powerful tools will help you to navigate and dominate the New Season! Live and Blitz Events - back on THE MAP! The meat and potatoes of Madden Mobile's daily updates are BACK! Live and Blitz Events are your key to some of the best rewards in the game! Be sure to login every day to see what you can earn in Madden Mobile. QB Scramble - The biggest request from the Madden Mobile Community is now HERE! Utilize the special skill set of NFL Players like Mike Vick and Cam Newton like never before! All New Gameplanning - Strategizing against your opponent has gone to a whole new level. Never has stacking the odds in your favor been so deep and fun. Use special collectibles to enhance your gameplay and even earn special TEAM Gameplan Collectibles that give any member of that team on your squad special boosts. 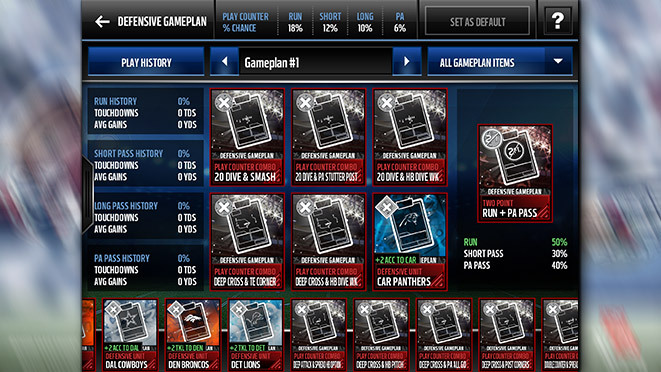 Binder and Set Management - With so many different team items to utilize and choose from in Madden Mobile, a place to keep them all organized and sorted crucial. The Binder has received upgrades and short cut for some of your most used features. In addition, Set Management has also never been so slick. 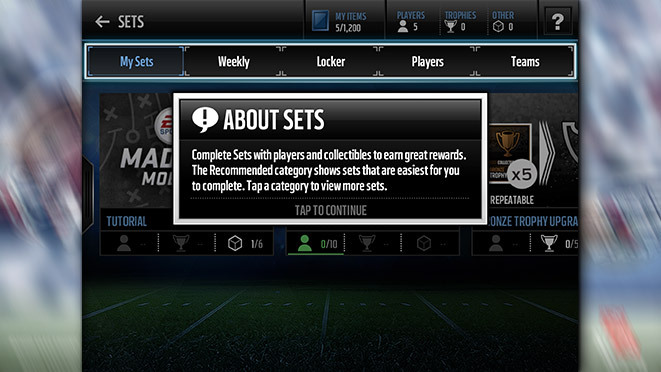 One of the biggest community requests, batch adding items and players to sets has been added this season! Reap the rewards of your Madden Mobile efforts in a snap! A whole new list of achievements are ready for you to tackle in the New Season. 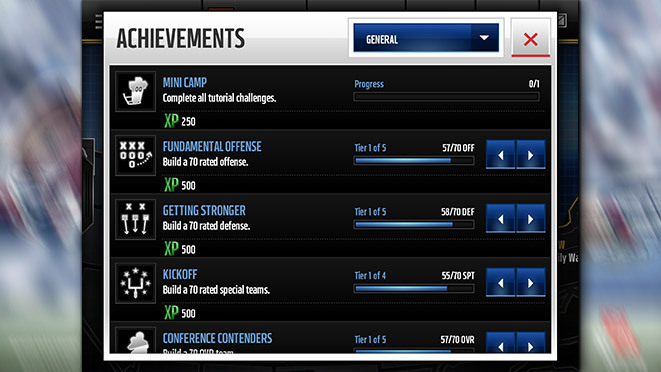 Earn XP and other rewards by checking off goals as you progress through your Madden Mobile journey. Leagues are BACK! 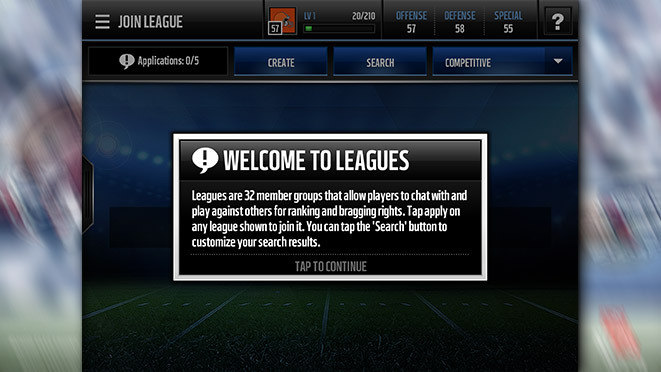 - Join or create a Madden Mobile LEAGUE to team up with friends or other rabid Mobile players. You can not only take on other Mobile Leagues but also show your prowess in inter-league play. Special rewards and features will only be available through playing in Leagues. Whether you're at your home, on the road, at the game or even on the sidelines Madden Mobile is your Anywhere, Anytime football experience. Get ready for a whole new season of Madden Mobile Football on August 16th! It's the most wonderful time of the year in Madden Mobile. It's time for Ultimate Freeze! Get the details on everything you need to know for this year's program. See the details of the huge November update with Madden NFL Mobile lead designer Danny Doeberling as he dives deep into all of the new features. 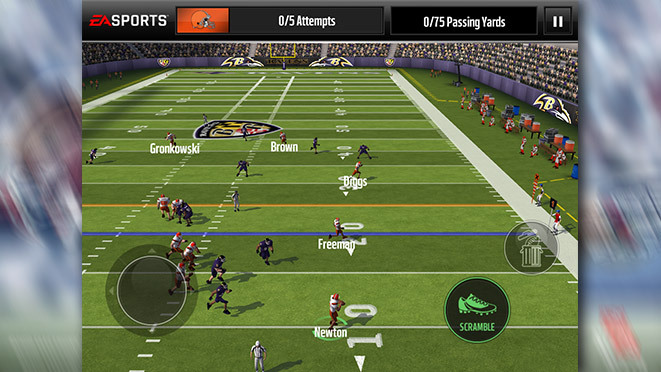 Managing Sets in Madden Mobile has never been this dynamic! You can take your Madden NFL Mobile team to the next level with these Game Changer player items, available now! Rookie Premiere events are live in Madden Mobile!